Threepence coin cufflinks available in 1937,1938,1939,1940,1941,1942,1943,1944,1945,1948,1951. 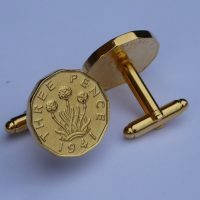 Thrift Threepence Cufflinks-Coinwear. The lovely design on these Threepence coin cufflinks is the Thrift plant . We have them available in the following years: 1937, 1938, 1939, 1940, 1941, 1942, 1943, 1944, 1945, 1948, and 1952. Diameter: 12 sided approx 2cm..